For its classical piece this season, the Colorado Ballet has chosen to stage Romeo and Juliet. It's timely of course, beginning a week before Valentine's Day, and the tragic tale is one of the most popular in the Shakespearean canon—but it is also a complex story involving many mood and scene changes, and Sergei Prokofiev's music, while gripping, is decidedly modern and wanting in classical opportunities. As a result, the ballet feels trapped between two worlds: that of 16th century Verona, with its attendant architecture, dress, and limiting social mores, and that of the frenetic modern world, where folks scurry from place to place, and where few dance on point. As the star-crossed lovers, Igor Vassin and Maria Mosina effortlessly capture the sweet joys of youth, but are limited by the score and the choreography from giving full flight together to the soaring emotions and utter commitment of their passion. Traditional scene drops come and go quickly, and except for the fight scenes, which highlight the exuberant dancing of Mikhail Ronnikov, Chauncey Parsons, and Zhuang Hua as Mercutio, Benvolio, and Tybalt, and the ensemble's charming folk dances in the carnival atmosphere of the marketplace, much of what takes place is acting to the music. Adding to the dissonance arising from the stylistic clashes of classical and modern elements is the recorded music, a victim of the Auditorium Theatre's woeful sound system. as Juliet, (Background) Gregory K.
The conceptual nature of dance, as opposed to the literal nature of Shakespeare's spoken word, begs for a reinterpretation of the ballet that allows the choreography to be freed up from sundry specifics to follow a dramatic and artistic arc worthy of this beloved story. 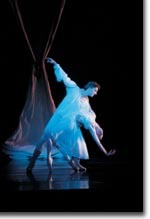 The Colorado Ballet's Romeo and Juliet runs through March 2nd. 303-893-4100.